Individuals with intellectual and developmental disabilities (IDD) often suffer from many health-related conditions. According to several studies and through The Arc’s HealthMeet project we have learned that poor oral health has been a significant problem for individuals with IDD. One-third of individuals with IDD have untreated cavities and eighty-percent have untreated gum disease. Tooth or gum pain can cause individuals to stop eating, affect speech/communication, and affect overall behavior and mood. There is a multitude of reasons as to why oral health is an issue. Accessibility to/from appointments, around the dentist office, and with equipment can all be large obstacles. Financial reasons are also another large factor as some dentists won’t accept Medicaid or dental visits aren’t covered under their current insurance plan. The lack of training and education for dentists regarding how to communicate and work with individuals with IDD can also impact the quality of services they are entitled to receive. Due to some of these constrictions, individuals with IDD are less likely to visit the dentist for routine care. Fear of the dentist can make getting routine cleanings and check ups a traumatizing experience. These preventative visits, which can help to find cavities and signs of gum disease early on, are then skipped letting small issues grow into larger problems. Organizations such as Practice without Pressure and the Blende Dental Group are striving to help improve oral health in individuals with IDD in their local areas by providing practice sessions to reduce fear and anxiety, and offering home visits. Individuals with IDD tend to have poor eating habits when compared to the general population, which can mean eating more sugary foods, sodas, fast food – all things that have higher levels of bacteria that cling to teeth, causing plaque to build up and eat away at the enamel on your teeth causing cavities. Problems such as sensory issues, the taste/feel of the toothpaste or toothbrush, and inability to grasp the toothbrush can all make daily brushing a challenge. Other times it’s as simple as just not remembering to brush twice a day letting plaque sit and eat away at teeth overnight while sleeping. Saliva is a natural agent that helps neutralize the acidity/plaque levels in our mouth. However, some medications (examples can be high blood pressure meds, antihistamines, antidepressants, etc.) can have a side effect of lowering the levels of saliva in the mouth (often called dry mouth). These lower levels mean that less plaque is washed away and it has a longer time to linger on teeth causing decay. Certain liquid medications can also be high in sugars as well. Poking a hole in a tennis ball and inserting the handle of a toothbrush or molding putty around the handle will make it much easier to grip and use. Simple diet changes, like cutting out sodas and sweets, in addition to also assisting with weight loss and energy levels, will also help lower plaque levels in your mouth that can cause cavities. Reduce snacking between meals – every time we eat our mouth turn into an acidic environment. In between eating is when our mouth has a chance to neutralize and return to normal levels. More snacking means the mouth stays at a higher acidic level for longer periods. 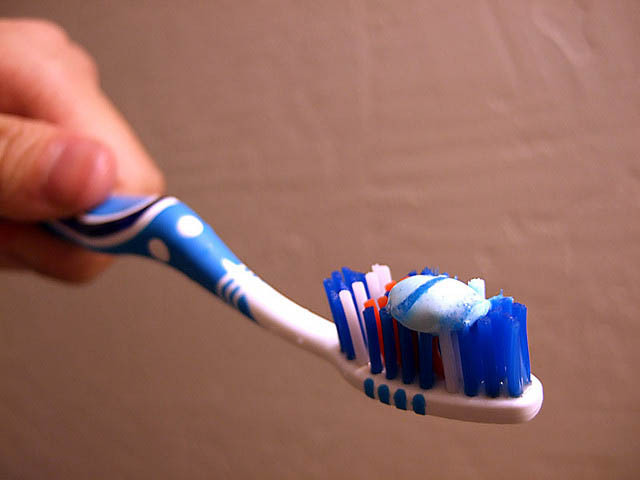 Set alarms on phones or leave notes in the bathroom as reminders to brush teeth in the morning and before going to bed. Apps for your phone can be downloaded to set reminders. If possible, try to take medications at meal times or at least before you brush your teeth at night so that plaque does not sit overnight on your teeth. Being aware of some of these factors that can influence your oral health will help individuals be more conscious in the future and realize the importance of trying to get to the dentist yearly for routine care. Check out Healthmeet’s webpage for more information, resources and webinars on oral health care for individuals with IDD. Working with patients with IDD is a lot like working with young children. You want to make it simple and easy and even a little fun for those patients because let’s be honest, plenty of us don’t do a good job with our daily oral care, even when we know what we are supposed to do.